Books+Publishing has undergone a series of significant changes over the past year as the business transitions to local ownership again, and we thought it would be useful to fill you in on some of those changes, as well as our plans going forward. We’ve recently restructured the B+P team to better play to everyone’s individual strengths. Current editor-in-chief Andrew Wrathall—who has been serving in the role since previous EIC Jackie Tang stepped down in July 2018—will move into the newly created role of production manager, where he will oversee print production, manage the website, and work with our stalwart advertising manager, Fi Tunnicliff, to build revenue and promotional activity. Current news editor Sarah Farquharson will move into the role of managing editor, where she will be responsible for the editorial direction of B+P. Sarah will manage B+P’s publication schedules, and will be able to indulge her passion for print by taking on responsibility for B+P magazine. Kelsey Oldham joined the team in August 2018 as assistant editor, and has quickly proved herself invaluable. Kelsey is now being promoted to editor, and will work with Sarah on B+P magazine as well as coordinating our pre-publication reviews. We’re pleased to welcome back former news editor Brad Jefferies in the role of digital editor. Brad will oversee our online news publications, including the Daily and Weekly Book Newsletter, as well as taking on the role of editor of the monthly Australian Self-Publisher newsletter. Former editor-in-chief Andrea Hanke has continued to work for B+P from her new home in Oxford, UK. Andrea is editor of the Think Australian newsletters, which currently reach an audience of over 8300 international publishers, agents and scouts. She’ll continue to work with Andrew on subscriptions, and with advertising manager Fi Tunnicliff on promotions. Fi continues to do a stellar job managing our advertising, and she’s currently taking bookings for print and digital advertising (including package deals). Magazine covers, custom Book Buzz newsletters and WBN Takeover packages have been particularly popular, so it’s worth getting in early to avoid missing out. We’re proud that B+P is now operating under the local ownership of Thorpe-Bowker general manager Gary Pengelly—who bought Books+Publishing from a local subsidiary of its US-based parent company, ProQuest, in July last year—and we’ve settled into our new offices in the Melbourne suburb of Richmond (we’ve changed our email addresses and banking details too). We’ve also revamped our masthead and updated the look and feel of our print magazine. 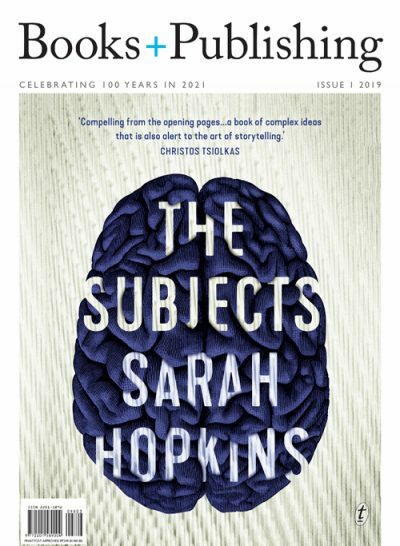 In the lead-up to B+P’s centenary celebrations in 2021, we’ve decided to theme each issue around a step in the publishing cycle. Issue 1 looked at authors, including features on author income, author speakers’ agencies and how unpublished manuscript prizes can launch a writing career. We heard from the Australian Society of Authors, bestselling YA author Lynette Noni, and welcomed two new columnists for 2019: Ventura Press publisher Jane Curry and high school library manager Karys McEwen. Issue two turns to the often invisible work of editors, and issues three and four will look at book designers and sales and marketing teams. If you have any news or feature ideas that you’d like to share with us, please email the editorial team at news@booksandpublishing.com.au. Among all these changes, we’ve continued to publish the latest industry news, features, analysis and pre-publication reviews. We recently launched a weekly publicity round-up segment to help booksellers get the jump on key coverage of books in the media, and we’ll soon be launching a regular spotlight on book buyers. You can find a list of the most popular news stories and reviews from the past week, month and year here. Don’t forget that we offer subscriptions at a discounted rate for members of our partner organisations, and we also offer a student discount. Get in touch with us at subscriptions@booksandpublishing.com.au for more information. The year is racing ahead, and we’re looking forward to continuing to serve the local book industry in the best way we can.